HP 6.1 mil Production Satin Poster Paper"(6.1 mil, 160 gsm- 3 inch core) Produce high-quality POS posters and GIS maps with this production poster paper that provides excellent image quality." HP 6.6 mil Production Matte Poster Paper"(6.6 mil, 160 gsm - 3 inch core) Produce high-quality POS posters and GIS maps with this production poster paper that provides excellent image quality." 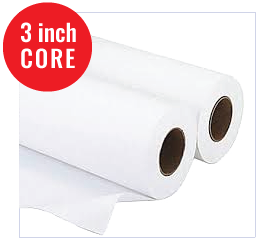 HP 7.3 mil Gloss Poster Paper"(7.3 mil, 190 gsm - 3 inch core) HP Gloss Poster Paper, 3-in Core. Produce point-of-sale (POS) posters at breakthrough speeds. Offer a wide array of graphic applications including POS posters and GIS maps."